Here are some cool shades to wear out on the links. 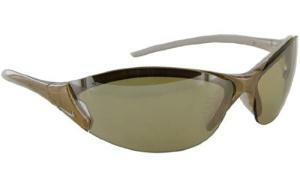 These Nike Revive Sunglasses utilize some of the latest technology that can improve your golf games. No, they aren't going to fix your slice! They will keep you cool though. (I mean literally.) They have a ventilated nose bridge and a ventilated lens. This reduces fogging, and the nose bridge minimizes slipping. The best thing are the lenses. They are scratch and impact resistant polycarbonate. Plus you can get multiple lenses, thus pick out different shades for different conditions. Finally, I really like the frameless design. Not only does it look cool, but I get a higher range of vision. On the downside, in the past when I've had sunglasses with the pop-out lenses, they had a tendency to warp over time. In other words, with some wear the frames can loosen up, and the lenses will pop out without warning. This can really mess up my big drive, especially when it happens at the top of my back swing! For a sporty frame but a different style, check out the Nike Revolve Sunglasses. Both pairs have secure wrap temples that fit snug on your melon and won't slip when you are swinging from the heels. Whichever you buy, they will certainly compliment your golf game (even if they don't fix your slice).